Jackie Mitchell is a journalist and public relations consultant with over fifteen years' experience. She works with small businesses and charities providing PR services. With a background as a features writer in the media, Jackie has worked on national newspapers, websites, consumer magazines, trade publications and radio stations all over the UK. For some years, she worked abroad - in Australia, Hong Kong and New York. After returning to London, she worked as an account director at several major London agencies. Find out more at www.jackiem.com and www.jackiemwriting.com. The Isle of Man wasn’t my destination of choice, but a friend invited us there to celebrate her special birthday. At Gatwick Airport North Terminal, I managed to find Ray a BLT (Bacon, Lettuce, Tomato) sandwich for lunch at Eat www.eat.co.uk totally forgetting he can’t eat tomatoes! Fortunately he was able to swap it for a chicken and bacon variety, while I opted for a simple tuna salad and a pot of mango and lime fruit. Very refreshing. En route from the Isle of Man airport to the hotel, our taxi driver gave us an overview of the island. It is 35 miles long, bigger than Malta and six times bigger than Jersey. Celebrities live here as well as billionaires and millionaires and people only have to pay 20% tax on salaries over £20,000 per annum. Apart from the tax breaks, the Isle of Man is well known for the motorcyle TT Races www.iomtt.com , which takes place 25 May to 7 June, 2013. The waterfront at Douglas, Isle of Man is reminiscent of Nice especially with the giant yucca plants, giving it a colonial feel (we were reliably informed they were a palm tree variety). Sadly the weather wasn’t like Nice with gusty bitter winds cutting right through us. The national emblem for the Isle of Man is the curious ‘three legs’ which can be seen everywhere. Apparently it dates back to the 13th century as the armorial bearings of three kings of the Isle of Man. We met up with our friends who had flown from Liverpool – it’s only a 20 minute flight – and had dinner in the restaurant at the hotel the Best Western Palace Hotel Casino www.palacehotelcasino.co.im. As it was a carvery operation, Ray could see exactly what he was getting and ordered lamb with vegetables (after checking that there was no butter on them). He also queried the gravy which, he was assured, didn’t have any dairy in it. I decided against the carvery and instead ordered salmon from the menu without a sauce and vegetables. I’d taken the precaution of emailing the hotel in advance asking for soya milk and gluten free bread, so at breakfast the next morning I was delighted that these were available. Ray chose the breakfast buffet – a plateful of bacon, beans, black pudding and toast with honey. Special mention has to be given to the Isle of Man kippers, which were served without butter and literally melted in your mouth. They were nothing like the kippers I’ve tasted in the past. 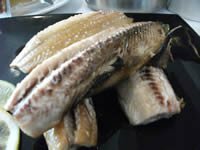 Apparently the best kipper supplier on the island is Devereau’s www.isleofmankippers.com and you can order them online for home delivery. The second day was sunny although chilly, but we walked on the beach to the bus stop to Castletown, which is dominated by Castle Rushen, a medieval fortress and former home to Kings and Lords of Man. 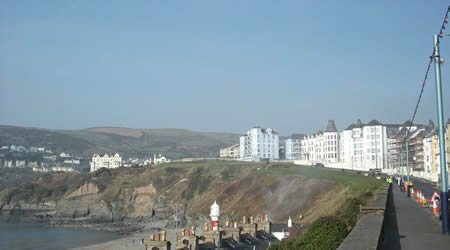 From here, we took another bus to Port Erin, set within a beautiful bay. We were told the beach is one of the island’s finest, but unfortunately it was too cold to find out! Most of the town looked shut, but after asking someone we found our way to the Falcon’s Nest Hotel www.falconsnesthotel.co.uk, where Ray and I had ham, egg and chips (Ray without the eggs). The next day we were told the buses were on strike, so decided to look round Douglas, stopping for lunch at Sir Norman’s at The Sefton Hotel www.seftonhotel.co.im named after the late famous comedian Sir Norman Wisdom who lived on the island for many years. 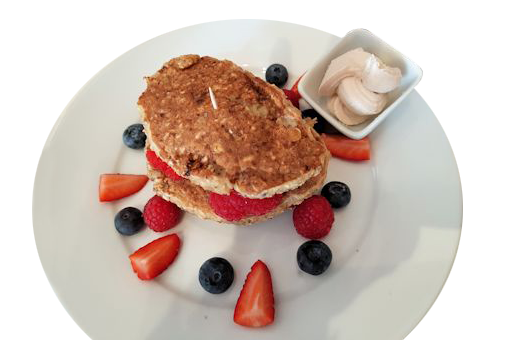 We were impressed to see that the menu had symbols denoting dishes that contain nuts, are gluten free and that are dairy free. Ray and I shared hummus and guacamole and a smoked salmon salad. For starters, Ray and I had warm smoked salmon, asparagus and poached egg (Ray had his without the egg). My friend ordered the famous Manx Queenies, with crispy bacon, croutons, citrus cream and watercress. Queenies are locally caught scallops. For the main course, I ordered the catch of the day – sea bass – with garlic and bacon and a garden pea sauce (the chef omitted the butter) and Cajun dusted calamari. Ray opted for the slow cooked shoulder of lamb, braised red cabbage and instead of the lemon potato mash (he avoids lemons), he was served mashed potato with Dutch beans and without cream. For the side dishes, we were presented with bowls of glazed carrots and beans without butter. This was a truly memorable meal; the food was delicious and so much trouble was taken in accommodating our various dietary requirements. On our last night, we met some friends at the Chaba Thai Cuisine www.chaba-thai.co.uk. Thai food is one of our favourites, particularly as they don’t use dairy. For starters, we chose chicken satay and peanut sauce and for the main course, Chicken Pad Thai. It was very tasty and the service attentive. During our trip, we discovered that we were ‘out of season’ which explained why everywhere seemed deserted and tourist attractions like the Steam Railway, which we wanted to visit, doesn’t start until Easter. Oh well, something for next time……..